The Church shall be called the Baptist Church of Mizoram (BCM), in Mizo it shall be known as Mizoram Baptist Kohhran. 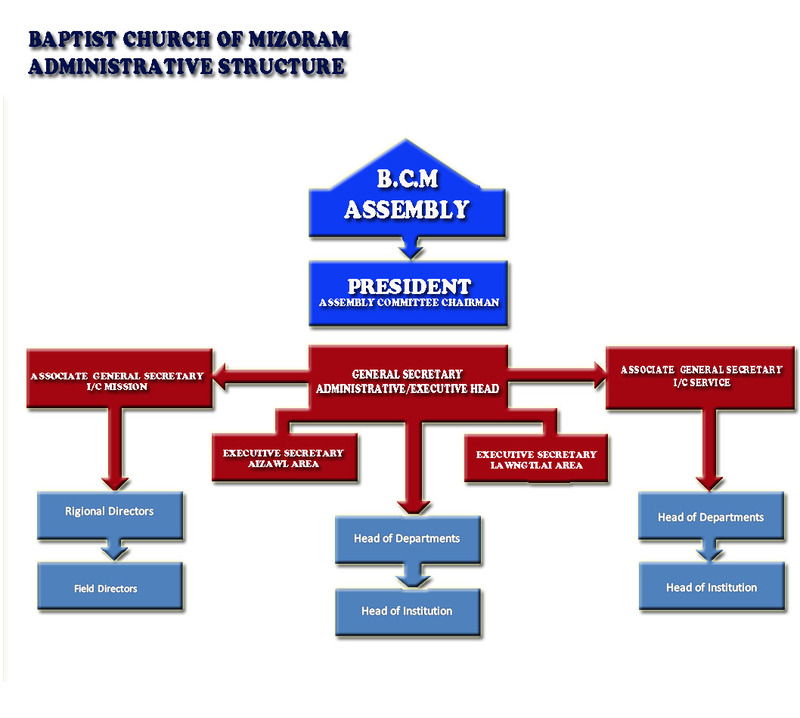 The Organisational Structure of the Baptist Church of Mizoram shall be as described below: There shall be four levels of Committees viz., the Local Church Committee, the Pastorate Council, the Area Baptist Council and the Assembly to carry out administration. 1. LOCAL CHURCH: The Local Church is a fellowship of believers, established by the Pastorate Council or the Administrative Committee to congregate as a basic ecclesial unit to worship and govern itself. 2. PASTORATE: Two or more local churches shall form a Pastorate. Every Pastorate shall have an Ordained Pastor to look after it, and as per the availability, there shall also be a Probationary Pastor. Every year a Pastorate shall have a Council Meeting and a Convention may also be organised. The Pastor must be present in its Council Meeting and Convention. If, due to unavoidable circumstances should the Pastor be absent in the Council, the General Secretary will depute a Pastor. 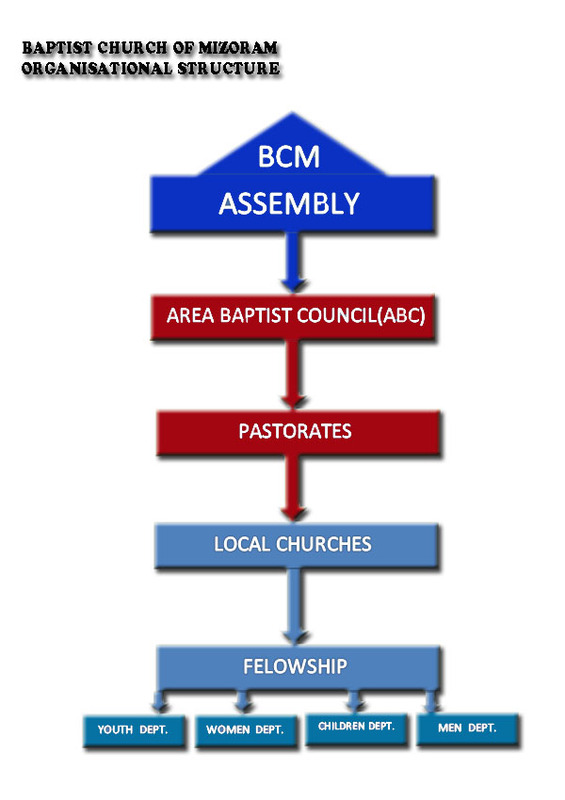 Two or more Pastorates shall form a Council and it shall be called “Area Baptist Council”. The Area Council Meeting may also organise a convention. For the whole of the Baptist Church of Mizoram, ther shall be an annual assembly which shall be called “The Assembly of the Baptist Church of Mizoram”, in short “Assembly”. 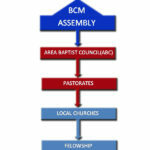 The Assembly is the highest decision making body of the BCM. (a) Assembly Executive Committee: To discuss important matters on behalf of the Assembly, there shall be a committee which shall be known as the “Assembly Executive Committee”. Office Bearers of the BCM, Heads of Departments and Institutions, the Out-going President, The Executive Secretaries, the Organiser of MTKP and the Organiser of the MBKHP shall be ex-officio members. Every Pastorate Council and the Area Baptist Council shall nominate two members, and the Assembly shall nominate five members. 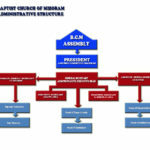 (b) Central Committee: On behalf of the Assembly, the Central Committee shall act as the pillar of the Central Structure of the Baptist Church of Mizoram. Office Bearers of the Assembly, Heads of Departments and Institutions under the umbrella of the Central Committee, the Out-going President, the Executive Secretaries, the Coordinator of the Pastoral Ministry, Office Superintendent, Organiser the Organiser of MTKP and the Organiser of the MBKHP shall be ex-officio members. Each Area Baptist Council shall nominate two members and the Assembly shall nominate 10 members. The President shall be the Chairman and the General Secretary shall be the Secretary. (c) Mission Committee: On behalf of the Assembly, the Mission Committee shall act as the manager of mission and evangelistic work both within and outside of Mizoram Office Bearers of the Assembly, the Out-going President, the Executive Secretaries, Director of the Home Mission, Mission Promoter, Dean of Missionary Training of AICS, the Organiser of MTKP and the Organiser of the MBKHP are the ex-officio members. Each Pastorate Council shall nominate one member and the Assembly shall nominate 10 members. The President shall be the Chairman and the Associate General Secretary i/c Mission & Evangelism shall be the Secretary. (d) Service Departments Committee: On behalf of the Assembly, the Service Departments Committee shall act as the manager of various departments under the umbrella of the Service Departments. Office Bearers of the Assembly, the Out-going President, the Executive Secretaries and Heads of Departments and Institutions under the umbrella of the Committee shall be the ex-officio members. Each Area Baptist Council shall nominate two members and the Assembly shall nominate 10 members. The President shall be the Chairman and the Associate General Secretary i/c Service Departments shall be the Secretary. (e) Nomination Committee: There shall be a nomination committee known as the “Assembly Nomination Committee”. Office Bearers of the Assembly, Out-going President and Executive Secretaries shall be ex-officio members. The Assembly Executive Committee shall nominate 10 members. The President shall be the Chairman and the General Secretary shall be the Secretary. Hey brother and stiser! After many years we connect again, but I always knew we would, some how, some way. It was awesome talking to John Sunday night. I can’t wait to share more and more in weeks and months to come. I love you guys (and your happy new band of kids)!